Charlie Chick is one of the best interactive books for young kids! Check out our Rocking Chick Paper Craft based on the book, with a cool video for help! I’m one of those people who believe that you’re never too young or too old for a book. A book’s a book and it’s charm can be appreciated at any age – even infancy! Of course, 8 month olds have limits when it comes to identifying the written letter, but that’s why we have interactive books! One of my favorite interactive books is Charlie Chick, the book about a rather large-sized chick who has an appetite to match! Charlie is absolutely delightful, and the book is perfect for kids in the age group of 0-3 years. That’s why Charlie Chick is my choice for the National Reading Month blog hop being organized at Learning and Exploring Through Play. 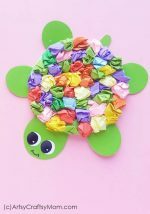 Many amazing bloggers have shared their crafts and activities here, all based on children’s books. My entry is a Charlie Chick-inspired Rocking Chick Paper Craft. I feel that the rocking part gives chick that right dose of personality to match Charlie’s! Watch the video below and then check out the step by step instructions below to make your very own rocking chick paper craft! 1. 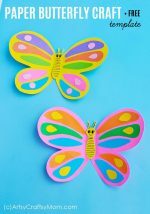 Start by cutting out two circles from the yellow construction paper – one large one and one small. This is going to be Charlie’s body and face. 2. Let’s get on with the body. Fold the large circle exactly into half. 3. On this semicircle, draw out the shape of the chick’s body along with wings on the side. Make small indentations in the wings to resemble feathers. Cut out the shape carefully, keeping the fold intact. 4. Now, it’s time to get the details. 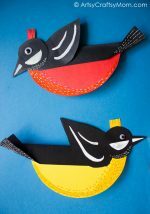 Cut out the chick’s feet, beak and crown out of orange construction paper. 5. Sick the head on the front of the body. Stick the feet on the underside of the body, and fold them forward. Stick on the eyes, beak and crown to the face. Set Charlie down on a flat surface with his feet pointing forward and watch him rock away! 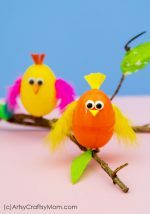 This Rocking Chick Paper Craft is great for little toddlers to play with after reading Charlie Chick. 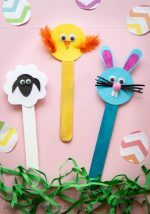 But even if your kids are older, they can still make this for Easter or spring, or even after a visit to the farm! This little guy is so cute, you don’t really need a reason to make him! « I only buy Milk in a Tetra Pak and why you should too? 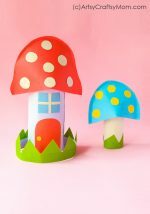 Hi Shruti, This article has been a great help as my daughter is busy in learning this craft and improving day by day . She tries doing new things and it helps in enchancing her skills. Keep posting , you are doing a great job.